Wide open Bay views from every living area in this open-concept sundrenched condo with fully renovated kitchen. Located in North Naples/Collier County, it’s only a short walk to Barefoot Beach. Community boat docks available in your own backyard, allowing you a scenic 5-minute boat ride to the Gulf through Little Hickory Bay & Wiggins Pass. Highly coveted Southern Exposure for picture perfect sunsets over the sparkling bay year-round, best enjoyed from the wraparound screened lanai, accessed from the master, guest bedroom & spacious living room alike. 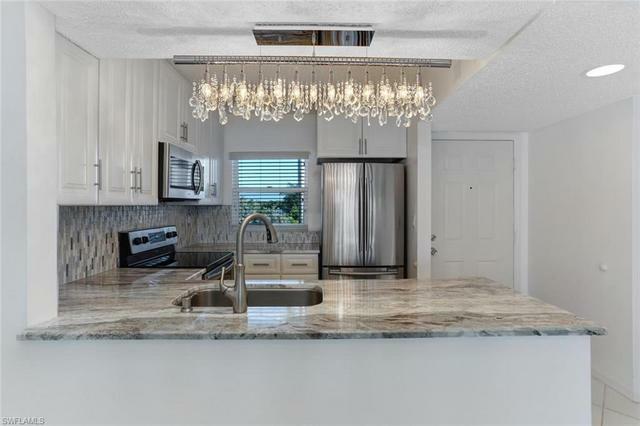 Kitchen boasts a modern décor with granite counters, crisp white cabinets & sleek handles, stainless steel appliances & stylish tiled backsplash. Master bedroom with ensuite, walk-in closet, dual sinks & soaking tub. Sizable guest bedroom with a bonus area large enough for an office or reading nook. Stackable washer/dryer in unit. Perfect vacation retreat, rental investment or forever home. Amenities: Heated pool & spa, clubhouse, bike rack, kayak storage/launch, BBQ grill & storage space. Close to Coconut Point, Mercato & restaurants galore. I was searching for a Property and found this listing (MLS® #218053932). Please send me more information regarding 4895 Bonita Beach Rd 105, BONITA SPRINGS, FL, 34134. Thank you! I'd like to request a showing of 4895 Bonita Beach Rd 105, BONITA SPRINGS, FL, 34134 (MLS® #218053932). Thank you!